You could’ve knocked me over with a feather when I saw there was a lobster roll truck parked across the street from my office today. I charged toward it, thinking it was surely the newly-debuted Luke’s Lobster truck. But I was wrong: there is a second lobster truck on the scene! “We know who the best one is,” said one man behind the counter with a wink. 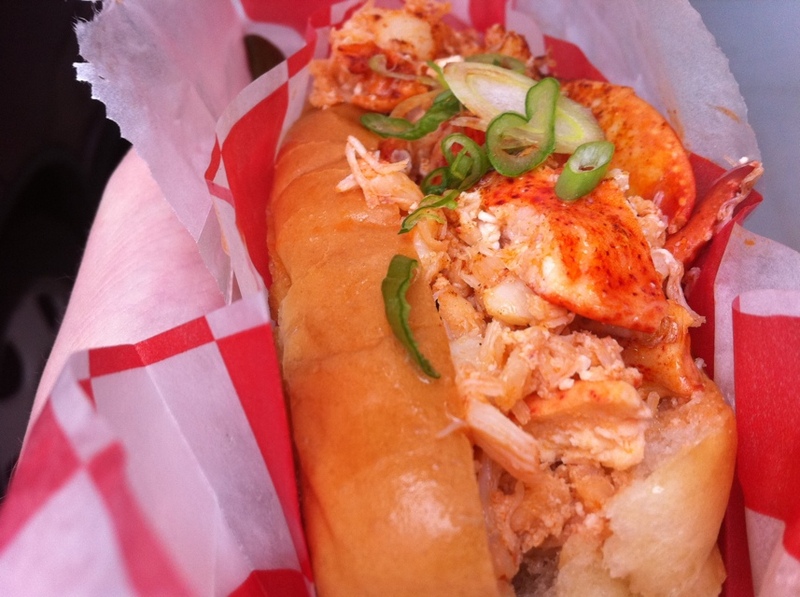 It is incredible to me to think there are now two lobster roll trucks on the road. Can any other city in the U.S. can make the same claim? 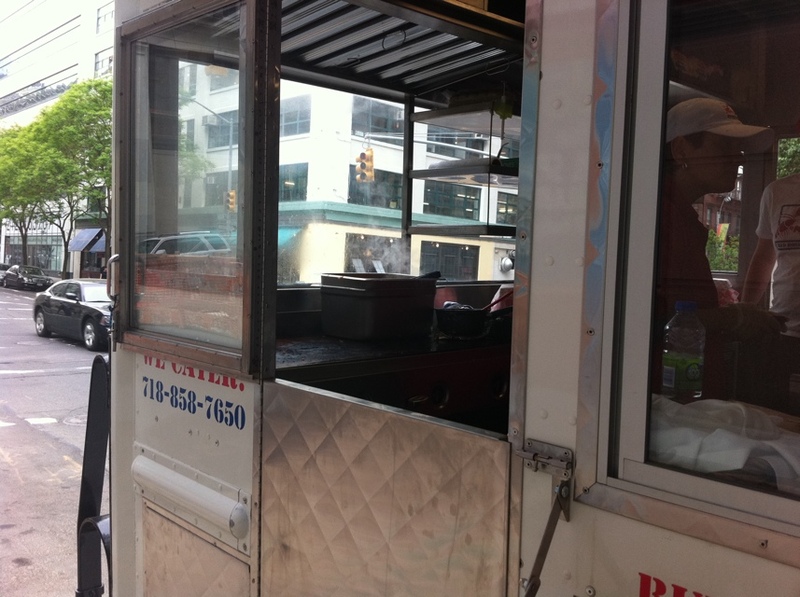 New York’s status as the street food capital of the United States seems assured. Take that, L.A.
Love the rear-view friendly logo. By far my favorite feature of the truck, other than the delicious lobster, is the hilarious rear-view friendly logo on the front. That’s genius. 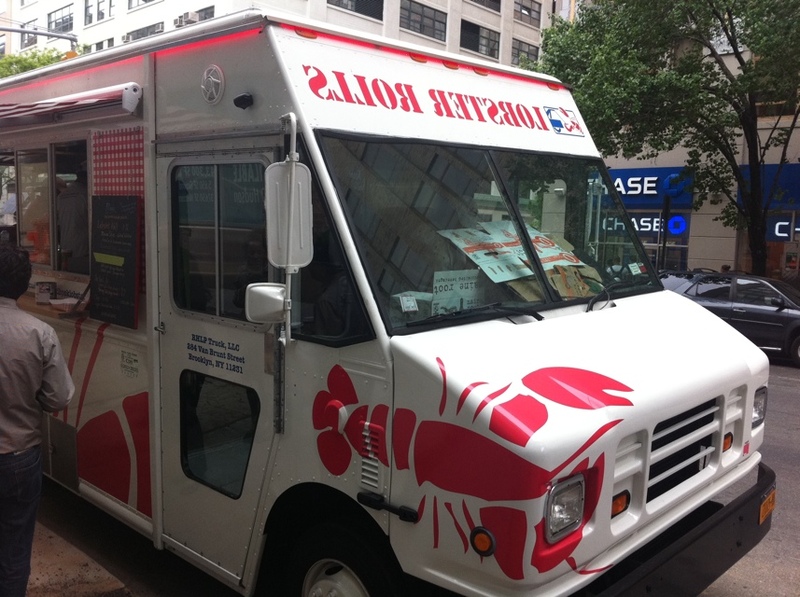 So how is the Red Hook Lobster Pound’s truck fare? Well, it is different (a bit) from what you get at the pound itself. I opted for the Connecticut-style roll, because I adore the Hot Lob at Abbott’s. Also, Luke’s does not offer a Hot Lob competitor (actually, score one for RLHP for variety alone), they stick strictly with the Maine-style roll. The steaming tin of hot lobster meat. At Big Red, they pull the hot lobster meat from a square tin sitting atop the hot plate. The good news is that the lobster is indeed quite hot, but it is also sopping from being poached in warm butter. When applied to the bun, which is not toasted, the bun almost instantly turned to mush. The result is extremely unwieldy, like a hot dog overloaded with sauerkraut with the bun giving way. You had better find somewhere to sit before eating it – then, perhaps, you could really enjoy it. No such luck for me. The roll itself, cleverly tucked into a paper sleeve. I was so concerned about the wind stripping all the heat from it I ate it standing up. Chunks of precious lobster spilled away from the ruined, soaked bun. Based on my experience today, I can’t recommend the Connecticut-style roll from the truck. Keep in mind: the rolls are $16 – or $18 if you get them with chips and a drink. Further, the taste wasn’t quite as delicious as what I had visiting the Pound itself. The lobster was hot and fresh but the flavor wasn’t quite as rich and buttery. There was almost a faint red pepper to it, and some of that faint briny fishiness I previously wrote about. In the interest of full disclosure, I’ve been going to the spectacular Luke’s Lobster pretty much every weekend since it opened in my neighborhood so my palette right now is geared that way. Next time I will get the Big Red’s Maine-style, hoping it is more user friendly. Follow them on Twitter or check their website. 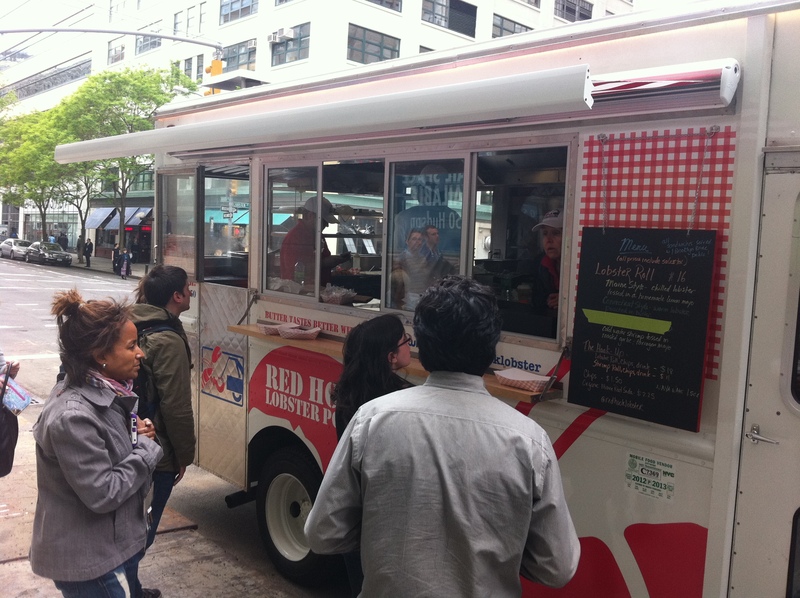 Luke’s Lobster Roll truck siting: outside of the Ed Sullivan theater on Broadway and 53rd and 54th. Apparently you can follow it on Twitter. Don’t know if they will return to that location or no, but the lobster roll was a good lunch.